Looking for an island getaway? Amelia Island, located in Northern Florida offers beautiful beaches, historic brick streets and list of fun things to do. Amelia Island is a treasure trove of history and heritage. One of the best ways to learn about the more than 4,000 years of history is to walk along the brick streets in historic Fernandina Beach. Many of the buildings are on the National Register and several historic homes are now cozy B&Bs. Hop on the Amelia Island Trolley for a historical tour of the town. Stop by the Palace Saloon for a drink; it’s Florida longest-operating saloon and was reportedly designed by Adolphus Busch of Anhesuer-Busch fame. Make a dinner reservation at Joe’s 2nd Street Bistro and dine on Chef Ricky’s delicious cuisine. 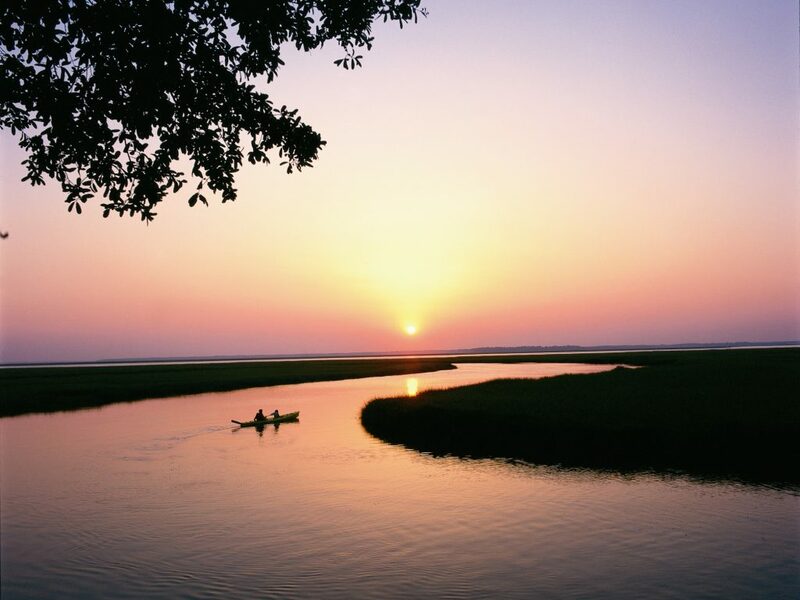 With a different eco-sytem than most of the Sunshine State, Amelia Island offers a combination of spacious white-sand beaches and natural green marshes. Stroll the sand along the Atlantic Ocean and search for seashell treasures like scallops, moon snail or whelk. Or better yet, stumble upon a set of pearly whites — yes, the beach is often littered with shark teeth! Visitors have found teeth belonging to great white, hammerhead and bull sharks. If you find a tooth that looks like a set of stair-stepped cusps (instead of a long sharp tooth), then you may have found a rare fossil from the cow shark. Don’t forget to snap a photo and use the hashtag #LoveFL! While you’re in town, you absolutely must make a reservation to dine at SALT. Not only is it one of the only five-diamond restaurants in Florida, Chef de Cuisine Richard Laughlin will blow you away with his creative and artful dishes. I recommend booking either the “Dine with the Chef” experience where you get to nosh on dish after dish after dish at the chef’s table in the kitchen, or try the “Chef’s Adventure Tasting Menu,” showcasing seasonal plates. You will thank me later. Set sail from Fernandina’s historic waterfront and cruise along salt marshes and secluded beaches. It’s not uncommon to spot dolphins, sea turtles, manatees and herons along the way. Some cruises offer incredible views of wild horses roaming free on Cumberland Island. The guides with Amelia River Cruises & Charters will enlighten you with local history as well as info about the eco-sytem. Amelia Island offers a number of entertaining events throughout the year. The Amelia Island Concours D’Elegance brings together automobile enthusiasts and collectors from all over the world each March. Other events include the Amelia Island Blues Festival in September, Jazz Festival in October, B&B Cookie Tour in November and the Holiday Home Tour in December. Or plan your own island event! The Ocean Club of Amelia offers a beautiful dining room that overlooks the sand dunes and Atlantic Ocean. Whether you’re planning a wedding, brunch or some other kind of special event, you’ll love the beautiful views and excellent food options. If You Go… Need help planning your trip? Check out AmeliaIsland.com.